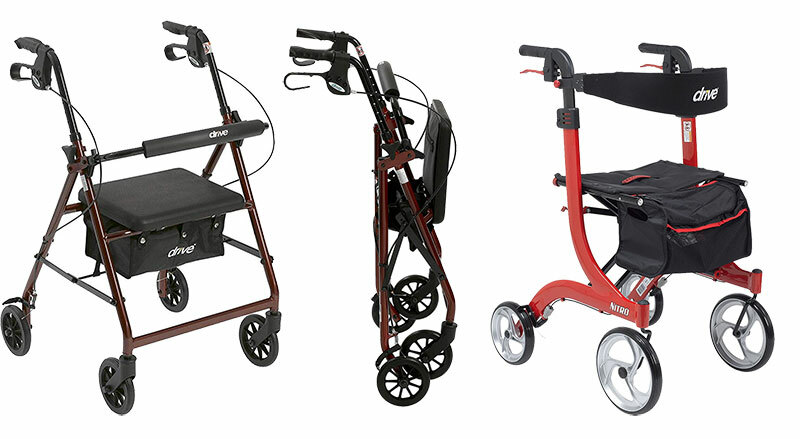 Walkers including folding, gliding, four-wheeled walkers, three-wheeled walkers, gliding and walker accessories. If good selection and great prices are important, you are here! Ambulation aids are for clients with pain or unable to bear weight on the legs; or with limitations in strength, joint motion, balance, coordination or sensation. The key to enhanced mobility and safety is matching the aid to the user’s needs, abilities, limitations, and environment. Alone or in combination, ambulation aids enable the user to function more freely, but the user needs “gait training” to achieve the most normal, efficient and safest walking pattern possible. Understanding the clinical parameters involved in matching the device to the client allows you to authorize an appropriate choice, question an order that appears inappropriate, or spot a mismatch of client and equipment. Include any respiratory, auditory, cardiac, orthopedic (e.g., braces, calluses, and bunions, foot deformities), neuromuscular or mental problems. Visual field defects and auditory difficulties may affect a user’s balance and gait. Obesity can affect stamina, balance, stability, and gait. Congenital or acquired deformities (e.g., scoliosis, leg length differences) are also important. Visual, oral, written ability to learn new tasks, motivation, body awareness, and attention span are critical to training in the proper use of an ambulation aid. Equally important are cognitive functioning, sound judgment, and task planning. Coordination (hand-eye, fine and gross motor), grip strength, endurance, flexibility, fluidity, posture, range of motion, upper and lower body strength including differences in specific body parts. Also important to observe are the client’s head and trunk tilt, the symmetry of stride, ability to turn, excessive shoulder dip, ankle or foot motion, and foot drag. The presence of tremors, involuntary movements of extremities, spasticity or rigidity is critical. Assess social as well as vocational environments so the client can ambulate effectively in both. When the user encounters slick surfaces, rugs, uneven floors, narrow doorways or halls, oversized furniture or stairs, does the ambulation device hinder or assist him? Consider also the client’s need for portable oxygen, history of falls, and training required to use the device properly. Depending on the consistency of supervision, one device may be more appropriate than another. Make sure the client can use the device effectively. If the user feels frustrated by a complex device, he won’t use it, and it is a wasted expenditure. A quality HME provider should have a liberal exchange policy and a commitment to personalized attention until the client is matched with the ambulation device fitting his needs and abilities. The handle can be almost any shape but is usually a knob. L shaped crutch, opera T pistol grip or hook. Canes take stress and pain from the legs and feet. Hold the cane of your strong side or. Move the cane opposite leg together. First, step up with the strong leg. Pushing up move the cane and the weak leg to that same step. First, step down with the cane and weak leg. Using the cane for support, lower the strong leg to the same step. Does it have a good, strong tip. In the winter add an ice pick. Make sure the cane is sturdy- should it have a base, stronger shaft, etc.? Is there enough strength and coordination to use a cane. Consult a doctor or physical therapist if you there are doubts about the cane or its use. Turn the cane upside down and put the handle on the floor. Stand with your arms at your sides. The tip of the cane should be at the level of your wrist. With the cane is upside down, mark the cane at the level of the wrist. cut the cane 1/2 inch shorter than the marked spot it. Most aluminum canes have holes and pins to adjust within one inch of the desired height. Canes are not designed to substitute for weight bearing on the legs, but rather to afford weight-bearing relief. Support may be increased during emergency maneuvers, such as when the user slips or stumbles on a wet surface, and the cane takes the brunt of the impending fall. A cane also improves balance and security by adding a third point of ground contact and alters the biomechanics of walking in a way that may relieve painful joints. Without a cane, a user may feel more pain, be non-ambulatory or may walk with an unstable gait pattern. 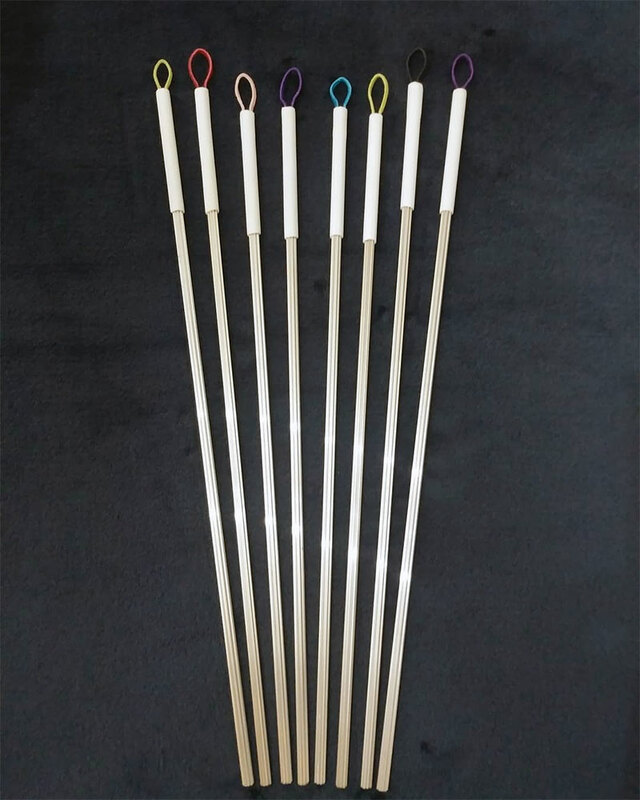 While most fixed-length canes are still made of wood with a curved handle, many of today’s adjustable-length canes are made of aluminum tubing with plastic or foam grips. Proper selection is key, as is client training in the appropriate use of a cane. A poorly fitted cane or misuse of an appropriate cane may aggravate the user’s limitations, impede healing or increase the risk of injury from a fall. Design: If the user should avoid weight bearing at the wrist, platform crutches or a walker with a platform attachment should be used in place of a cane. Although small-based quad canes are generally less stable than those with large bases, they are also less likely to interfere with a user’s foot while walking. Single point or straight canes are indicated when gait or balance are mildly disturbed; only minimal support is needed; there is an endurance problem, or pain is present but does not prevent weight bearing. Side walkers (hemi) and quad canes are the devices of choice for clients with poor balance or one-sided weakness (hemiparesis) from stroke or other injuries. Some quad canes have a set of vertical legs and a set of legs angled outward at the base. This model requires the user to walk with the angled legs facing away from the body. 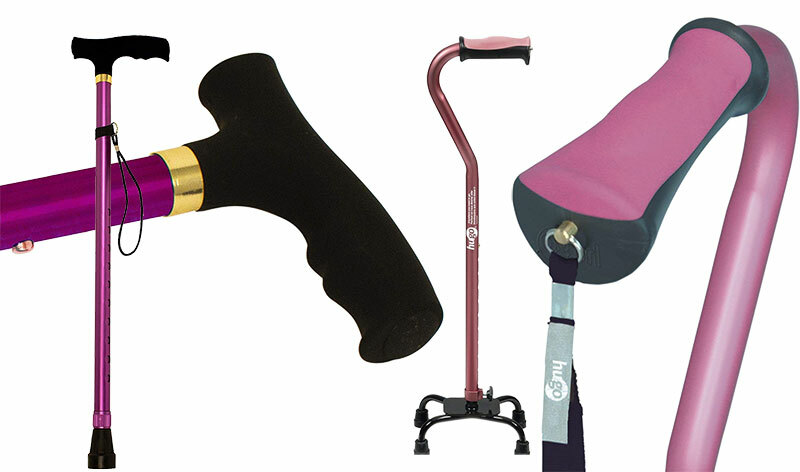 Design variations in canes and handgrips make it easy to fit the cane to the client’s need. A cane with a handle centered over the tip is better balanced. Some have special handgrips to provide more comfortable or biomechanically correct hand positions. 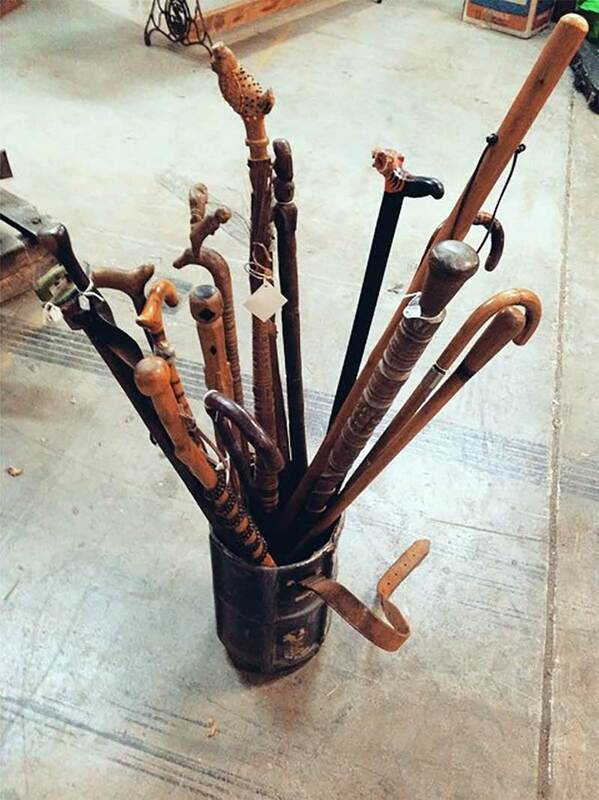 For transport, some canes come with a wrist strap, while others are retractable. Ensure the device is compatible with the client’s lifestyle, desires, and goals. The more conspicuous or heavy the device, the less likely the client will use it. The more training required to use it, the more likely it will remain in the closet. If consistent use for increased safety is the goal, it’s important to bow to client preference for simplicity. Some canes have adjustable-angle tilt handles. Youth and tall adult sizes are available. Confirm with your HME dealer whether ice tips (retractable sharp points that dig into ice for better gripping), wrist strap, vinyl cover or cane holder are included or are extras to be purchased separately. Optional handgrips of Devon or Hypalon are now available. Traditional wooden crutches with wing-nut adjustments are still commonly used by healthy people with short-term needs. But newer crutch designs – bright anodized (colored) aluminum with push-button adjustments – are not so obviously institutional and have fast become the “crutch of choice” for professionals and consumers alike. The physically fit or younger client with good balance and strength may find crutches more practical for walking and stair climbing. Crutches can support more than 50 percent of body weight during ambulation. The three types of crutches are auxiliary, forearm (also known as Lofstrand) and platform. Auxiliary crutches, provide stability with a padded piece held between the chest wall and upper arms and may be easier to use by those with weak arms. The forearm crutch presents a streamlined appearance, is less cumbersome than the auxiliary crutch, and allows the client to use his hands without dropping the crutches. More appropriate for people with long-term needs, the forearm crutch features a flexible cuff that surrounds the forearm just below the elbow, helping to reduce arm strain. Cuffs that adjust both in length above the handgrip and in diameter afford the most comfort. The forearm crutch requires a strong handgrip and is less stable than the auxiliary crutch. Many auxiliary and forearm crutch models now have telescoping mechanisms that retract the shaft for easy transport. 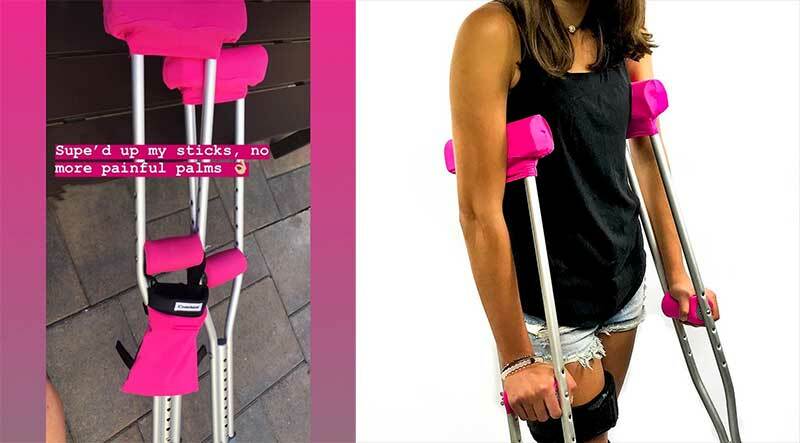 With padded platforms, or “troughs,” upon which the forearms rest and vertical handgrips to hold on to, the platform crutch provides a larger area of contact for transmission of the load to the shoulder girdle. To help the user’s hand lift the crutch, an adjustable strap holds the forearm to the platform. This kind of crutch is an alternative for people with gripping limitations or problems bearing weight in the hand, wrist or forearm. It offers more stability than the standard forearm crutch. For the frail or vision-impaired user, ease of adjustment is key. Crutches with push buttons instead of wingnuts are easier to adjust, and the user is less likely to lose any parts (washers, bolts, wing nuts, etc.). Generally, replacing adjustment bolts on wooden crutches requires more effort to align the parts compared to aluminum crutches. Some models have spring-loaded adjustment buttons that are pulled out instead of pushed in to release the mechanism. These are easier to use than push buttons, which require constant pressure and good hand coordination. Crutch manufacturers offer sizes for children, youth and tall adults as well as different tip sizes and ice tips. Cushions and grips also come in varied sizes. Some forearm crutches offer front or side opening cuffs. Added options include spun ends to reduce noise, stair deflectors for added safety, contoured and non-rotating handgrips, locking wing nuts, and client fitting-scale indicators. For significant weight-bearing needs, when the choice is between a walker and crutches, evaluate the need for more stable support provided by a walker versus the versatility of crutches (such as on stairs). Because the walker is more stable and can stand by itself, older clients find this device easier to manage. When primary use is within a single-level home, the walker is a good choice, although fitting through doorways and bathrooms may present problems. Many current walker designs, of aluminum with adjustable-length legs, are foldable, allowing greater storage and portability than rigid models. A carrying pouch or basket may allow safer ambulation if the user needs to carry items. Some walkers are not safe for people weighing more than 230 pounds. In a multi-level living situation, it may be safer to have one walker upstairs and one downstairs with special stair railings or a lift to facilitate access between floors. The legs of some reciprocal walkers have been found to slant inward and become increasingly unstable as the legs are lengthened. Assess each model for this flaw when considering a reciprocal walker. Walkers vary greatly in weight, so evaluate the upper body strength of the user. Wheeled walkers are appropriate for a client who needs enhanced stability but may not need to rely on the walker for weight bearing, or for a client with little upper body strength. Certain wheeled models fitted with cable brakes require a firm gripping action to stop – suitable only for clients with the requisite hand strength and cognitive function. Other models have direct-action brakes that require only that weight be placed on the walker to activate. Folding walkers are useful for the highly mobile person (e.g., a car user) if the individual can fold, unfold and secure the walker in an open position. For the client with a tendency to lose balance backward, using a slightly lowered walker brings his height forward. A walker disrupts normal gait pattern and is usually prescribed only after other ambulation aids have been found unsuitable. Use of a walker requires basic but essential training for both indoor and outdoor terrain. Your client needs a level of cognitive functioning enabling him to remember proper use of the walker from moment to moment. If the client is unable to understand or retain how to use the walker, he may be at greater risk for injury. Evaluate the home, work, and recreation environment for accessibility. In tight bathrooms, for example, a standard walker prevents access and grab bars may need to be installed as an alternative means of support. Certain walker models are designed for use over the toilet; others are flared, allowing closer access to the bedside, chair, and commode. Walkers with two folding locks require less force to unlock than single-lock models, but they also require more steps to complete folding. On some walkers, the front two legs can be replaced with wheels or low-friction pegs, enabling the user to roll or slide the walker instead of lifting it, while the rubber tips on the rear legs act as brakes. However, the wheeled walker is less stable and doesn’t roll easily over carpet or rough terrain. Reciprocal walkers are articulated to allow each side to be moved forward independently, facilitating the normal walking pattern of opposing the motion, which the standard walker inhibits. A reciprocal walker is often an appropriate interim device between crutches and a walker but is not suitable for weight bearing. Hemi-walkers adapt for use with one hand. The side walker is both a walker and a four-footed, pedestal-base cane with a grip. Some side walkers have an additional handgrip to help the user rise from a seated position. The wide footprint of most side walkers makes it more stable than a quad base cane and tends to support more weight. However, the side walker can be heavier and easier to trip over than quad canes. For tall users, extra-long leg attachments can be purchased. 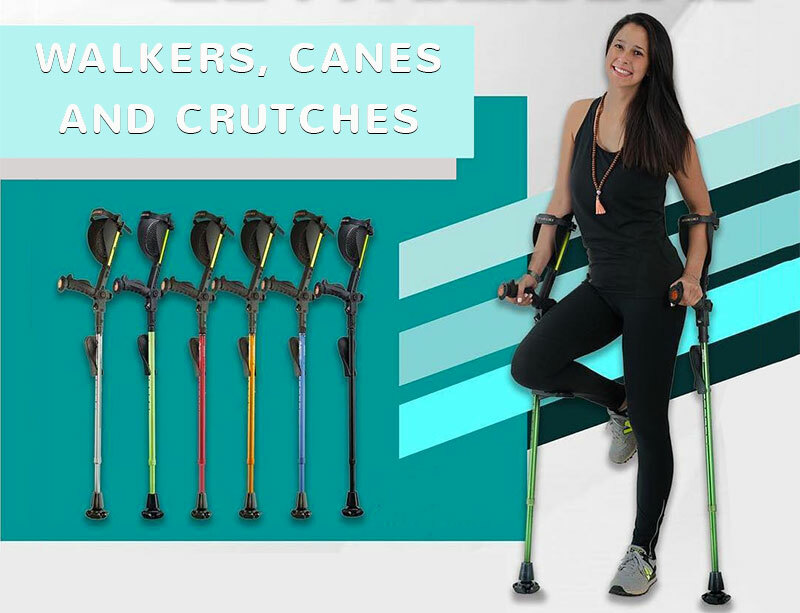 Some walker models offer flexible handles, ice tips, sling seat, carrying pouch or basket, rear glide and brake attachments, platform and forearm attachments, corrosion-resistant brass push buttons for height adjustment, one-step folding with palm release, and positive locking. Models are available in pediatric and small-adult sizes.